Unidad 2.2 Part 1. 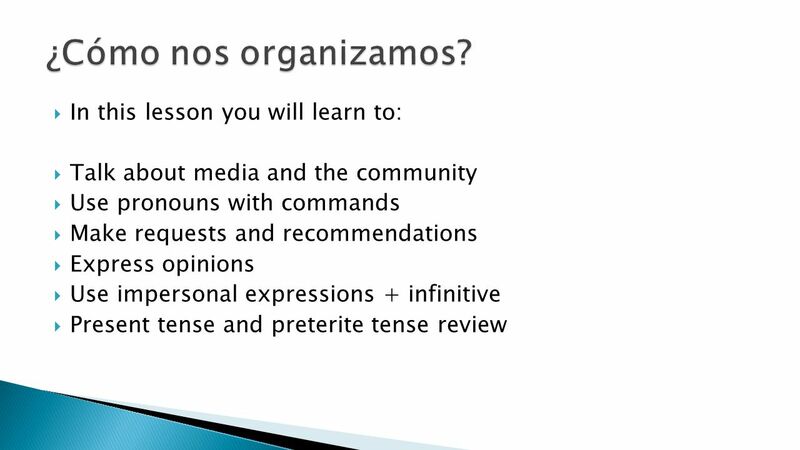  In this lesson you will learn to:  Talk about media and the community  Use pronouns with commands  Make requests and recommendations. 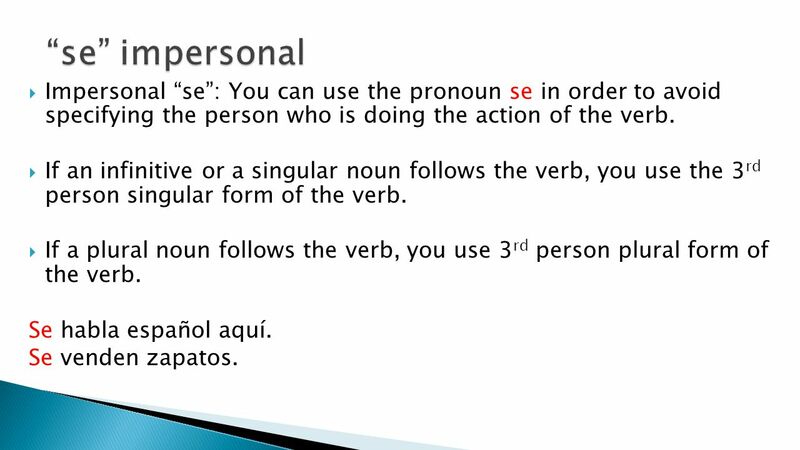 8  Impersonal “se”: You can use the pronoun se in order to avoid specifying the person who is doing the action of the verb. 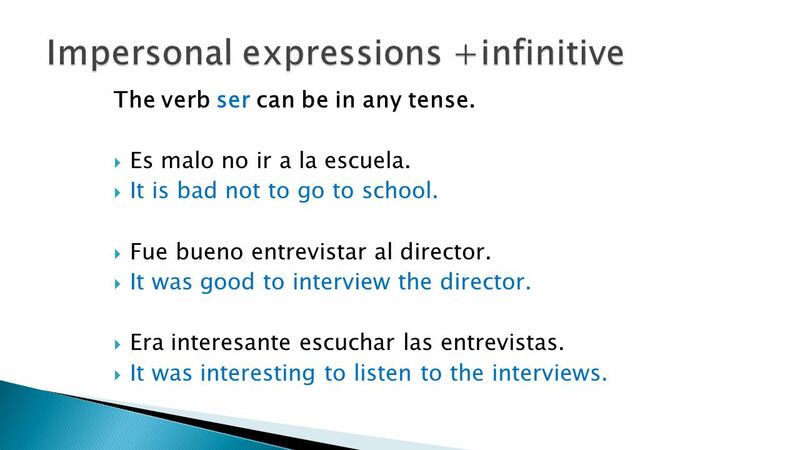  If an infinitive or a singular noun follows the verb, you use the 3 rd person singular form of the verb. 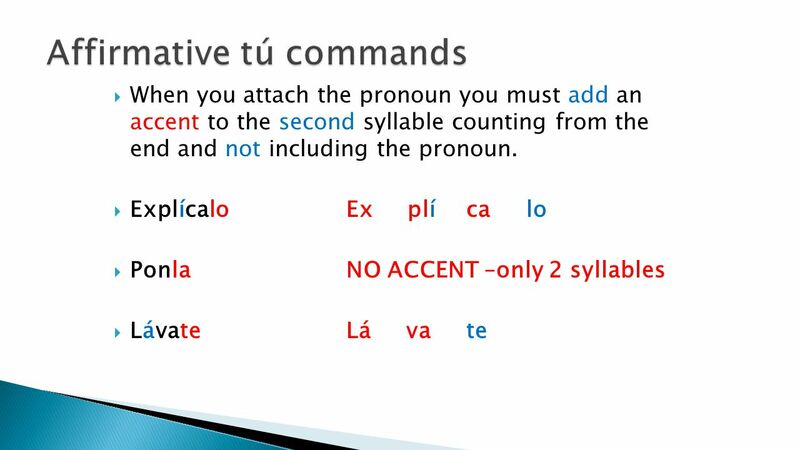  If a plural noun follows the verb, you use 3 rd person plural form of the verb. 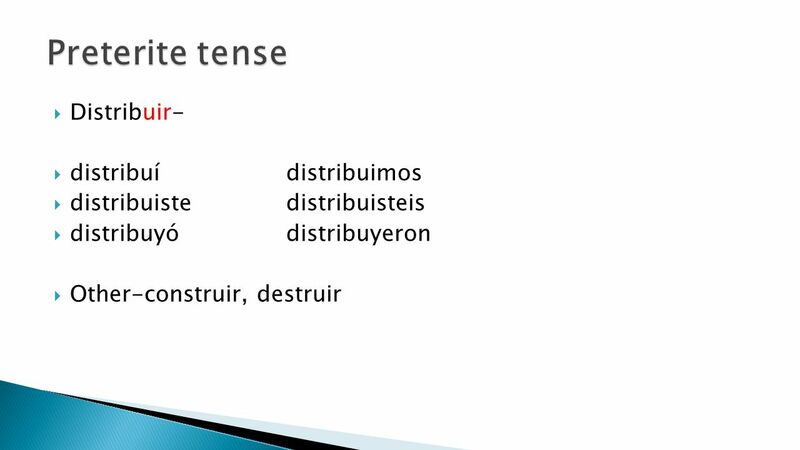 Se habla español aquí. Se venden zapatos. 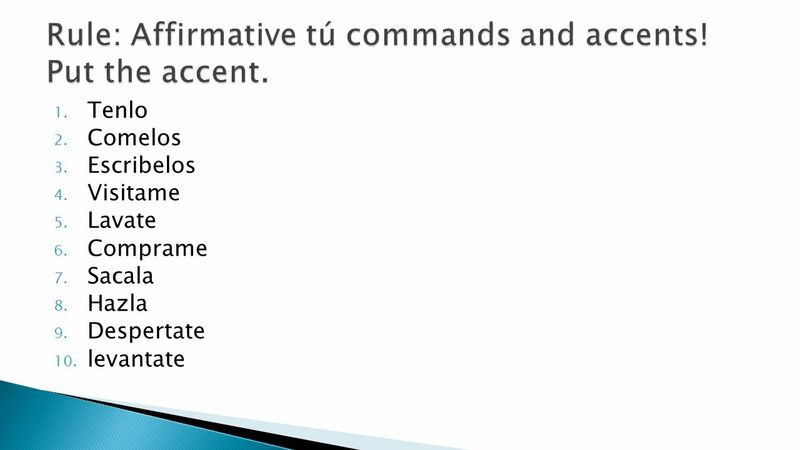 9  In Spanish, the placement of object pronouns depends on whether a command is affirmative or negative. 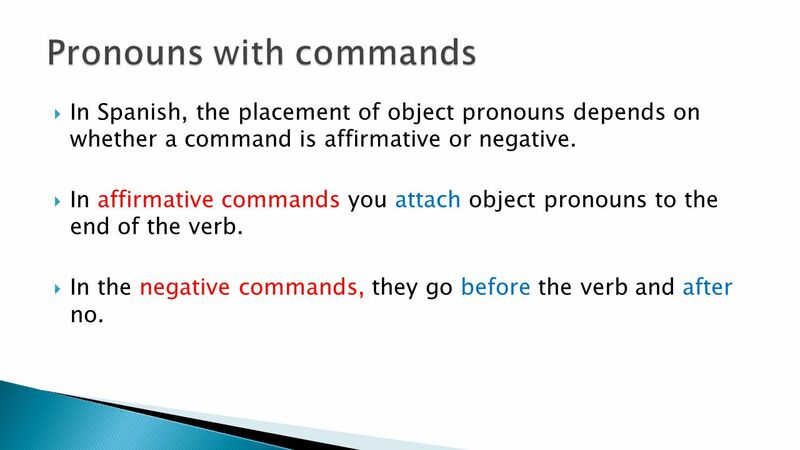  In affirmative commands you attach object pronouns to the end of the verb. 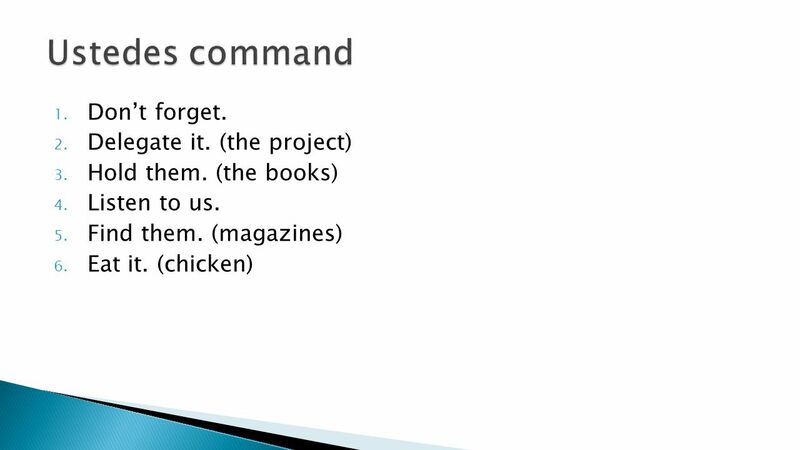  In the negative commands, they go before the verb and after no. 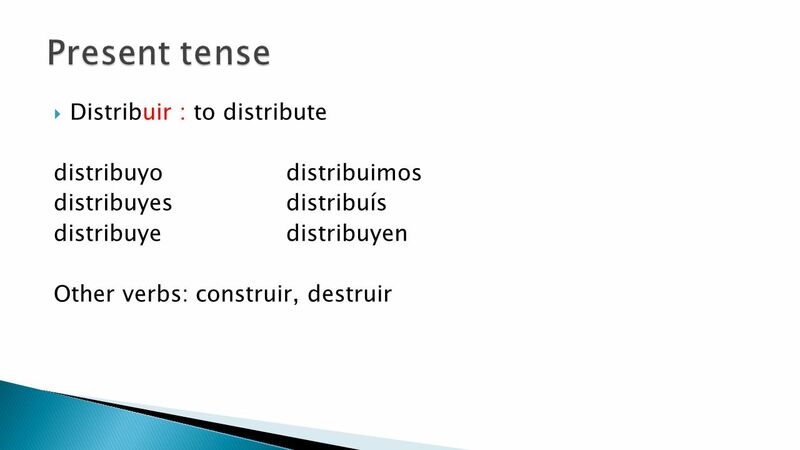 12  Direct object receives the action of the verb. Answers the questions to who or what.  I sell the book. 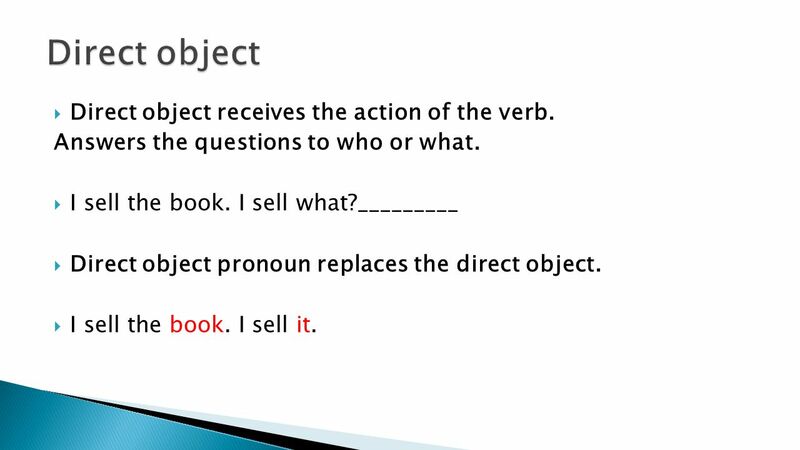 I sell what?_________  Direct object pronoun replaces the direct object.  I sell the book. I sell it. 13 me (me)nos (us) te (you)os (you pl) lo (it,him,you)los (them,you pl) la (it,her,you)las (them, you pl) Sell it! (the book) Véndelo Don’t sell it. (the book) No lo vendas. 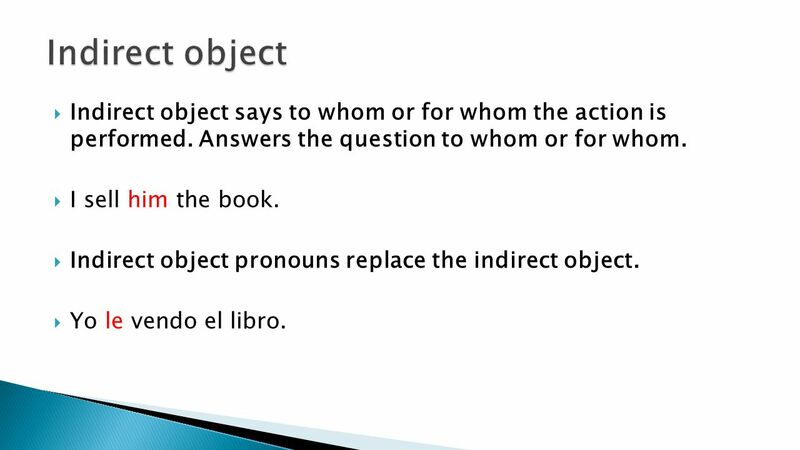 15  Indirect object says to whom or for whom the action is performed. Answers the question to whom or for whom.  I sell him the book. 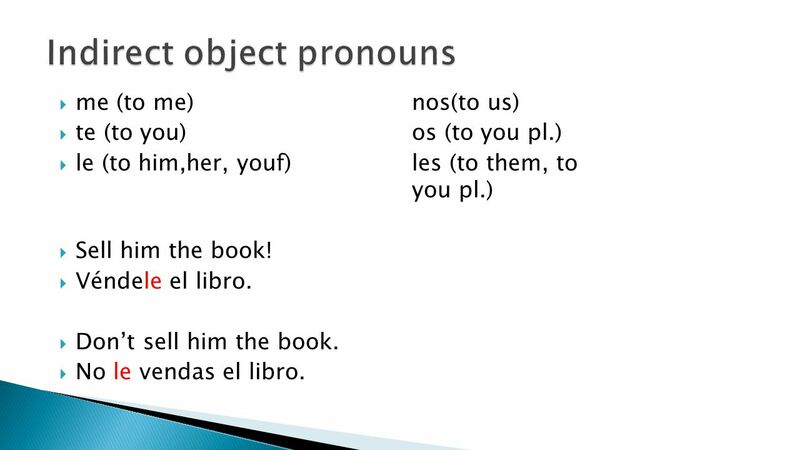  Indirect object pronouns replace the indirect object.  Yo le vendo el libro. 16  me (to me)nos(to us)  te (to you)os (to you pl.) 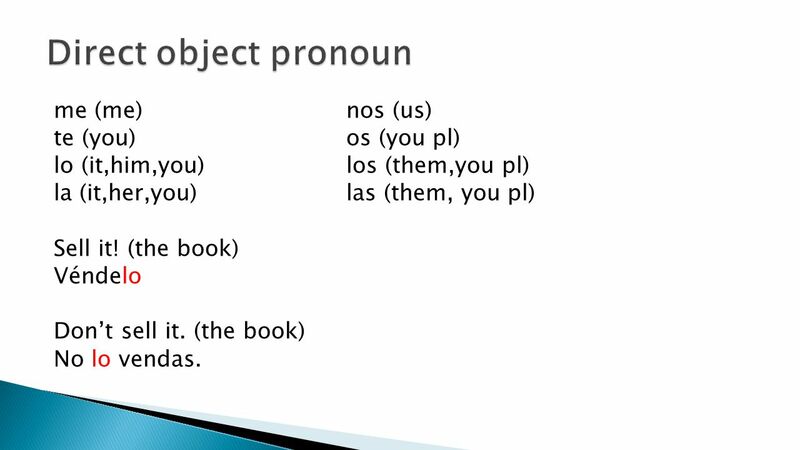  le (to him,her, youf)les (to them, to you pl.)  Sell him the book!  Véndele el libro.  Don’t sell him the book.  No le vendas el libro. 17 1. Explain the lesson to her! 2. Sell the book to us! 3. Read the magazine to him! 4. Tell me the truth! 5. Buy them the newspaper! 6. 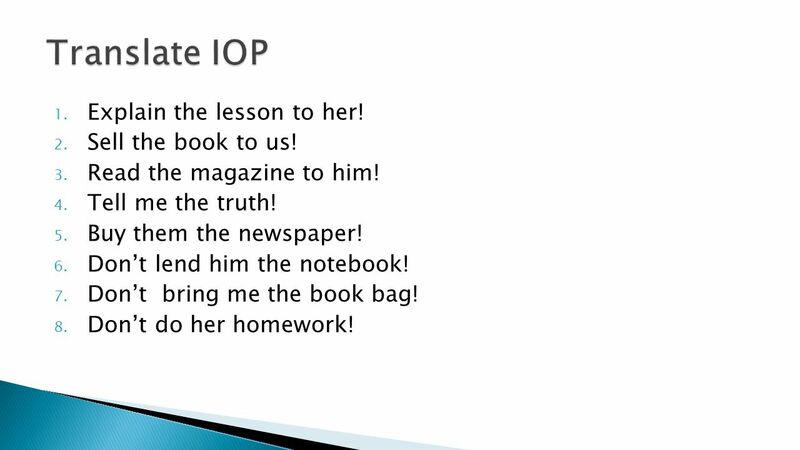 Don’t lend him the notebook! 7. Don’t bring me the book bag! 8. Don’t do her homework! 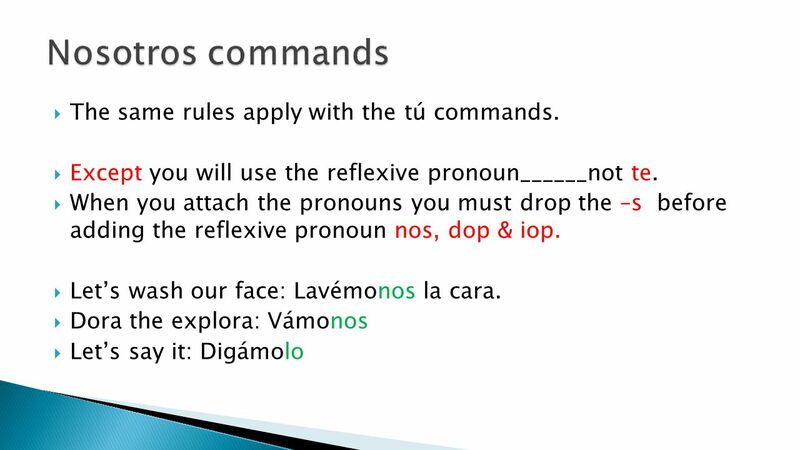 18  Reflexive verbs take reflexive pronouns. 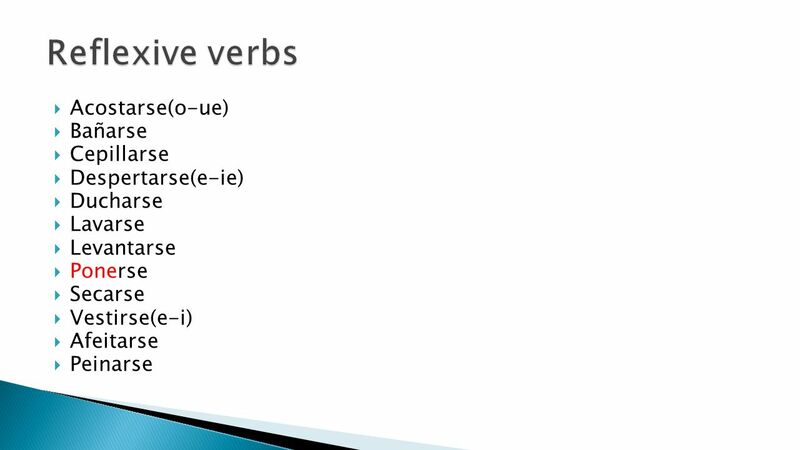  Reflexive verbs are actions done to oneself. 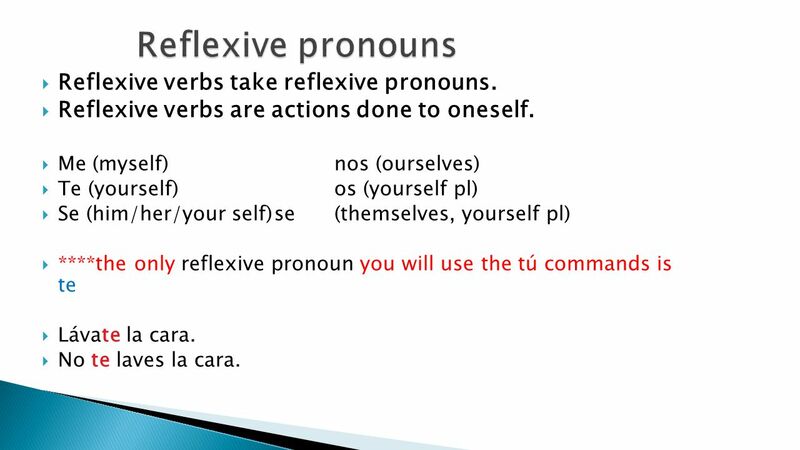  Me (myself)nos (ourselves)  Te (yourself)os (yourself pl)  Se (him/her/your self)se (themselves, yourself pl)  ****the only reflexive pronoun you will use the tú commands is te  Lávate la cara.  No te laves la cara. 20 1. Go to bed! 2. Take a bath! 3. Brush your teeth! 4. Wake up! 5. Take a shower! 6. Don’t wash your face! 7. Don’t get up! 8. Don’t put on your clothes! 9. Don’t dry yourself! 10. Don’t get dressed! 22 1. Don’t organize it. (the project) 2. Call her. 3. Comb yourself. 4. Don’t explain it. 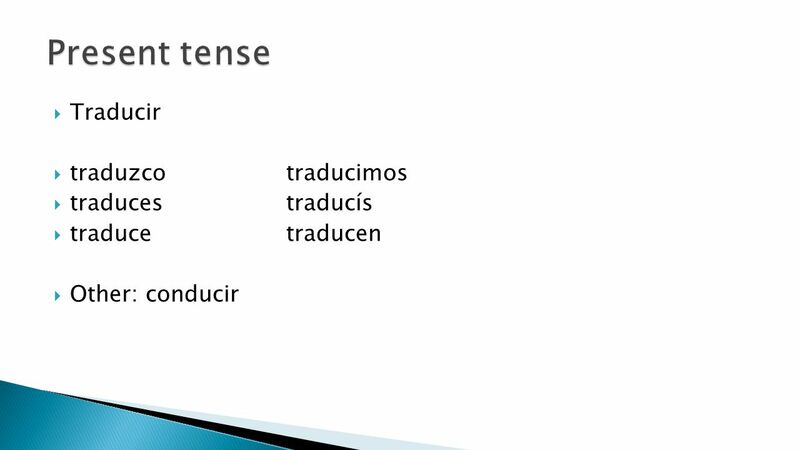 (the lesson) 5. Give me the book. 6. Go away. 26  To state an opinion, or suggest that something should be done without indicating who should do it, use an impersonal expression plus an infinitive. 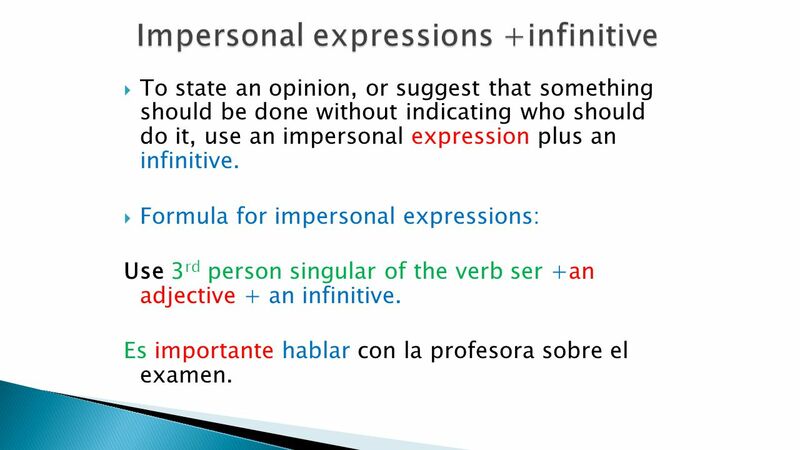  Formula for impersonal expressions: Use 3 rd person singular of the verb ser +an adjective + an infinitive. Es importante hablar con la profesora sobre el examen. 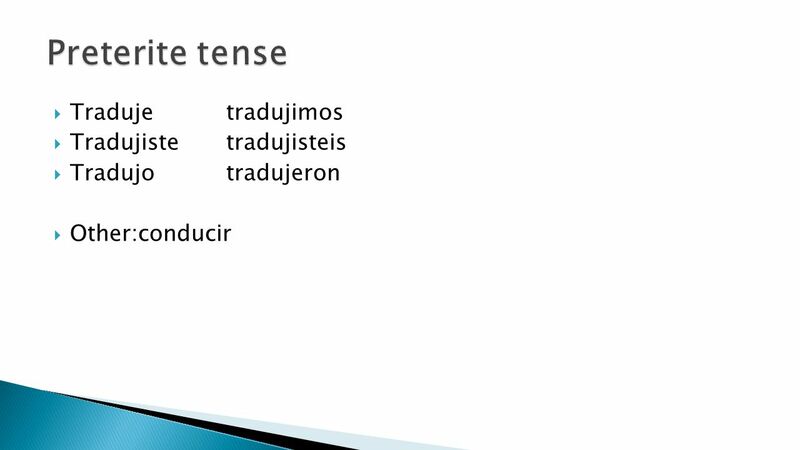 27 The verb ser can be in any tense.  Es malo no ir a la escuela.  It is bad not to go to school.  Fue bueno entrevistar al director.  It was good to interview the director. 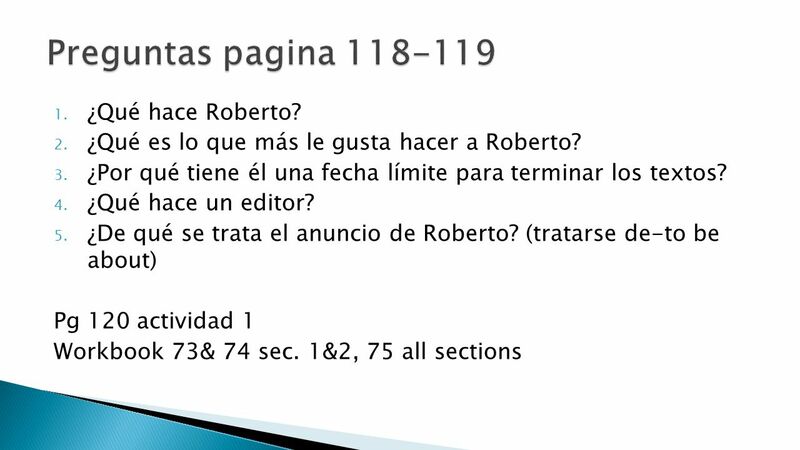  Era interesante escuchar las entrevistas.  It was interesting to listen to the interviews. 28 1. It is good to eat healthy. 2. It is difficult to listen to the professor. 3. It is necessary to do your homework everyday. 4. It is bad to talk in class. 5. It is impossible to read the book. 6. It is best to go to sleep early. 7. It is better to arrive on time. 8. It was easy to write the letter. 9. It was impossible to swim in the ocean. 10. It was good to see my friends. 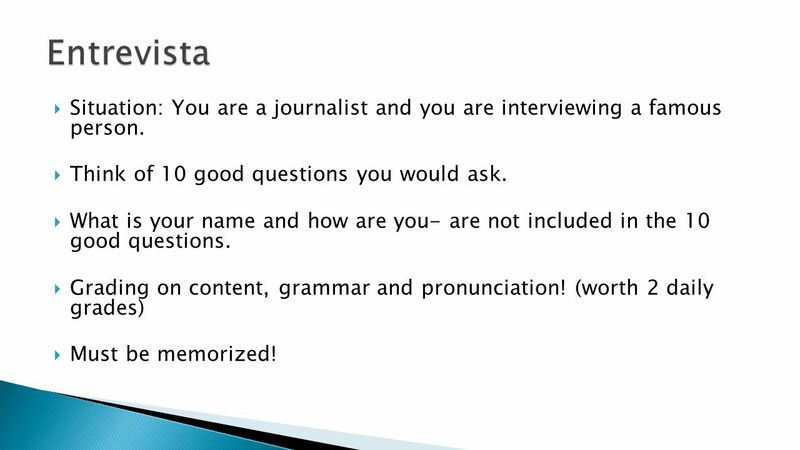 29  Situation: You are a journalist and you are interviewing a famous person.  Think of 10 good questions you would ask.  What is your name and how are you- are not included in the 10 good questions. 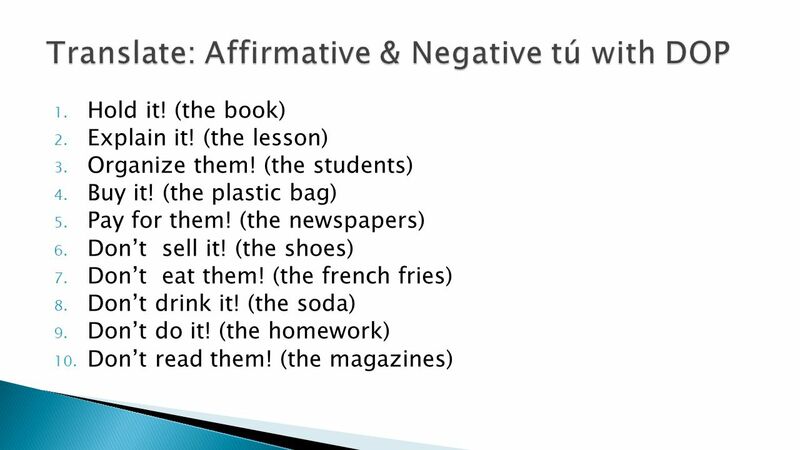  Grading on content, grammar and pronunciation! 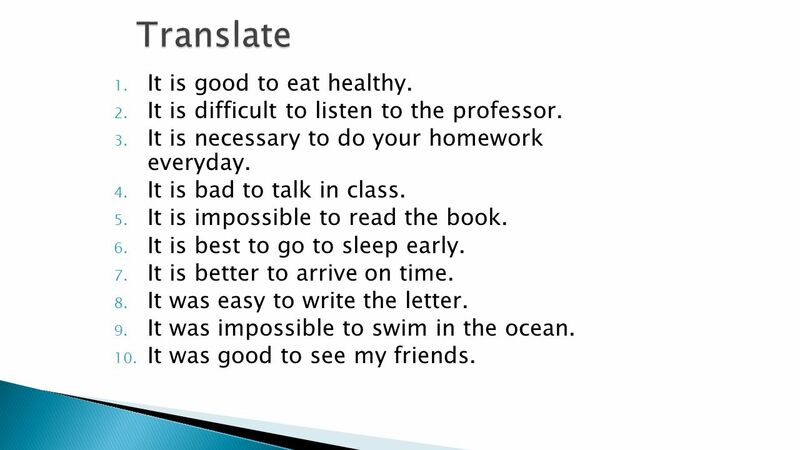 (worth 2 daily grades)  Must be memorized! 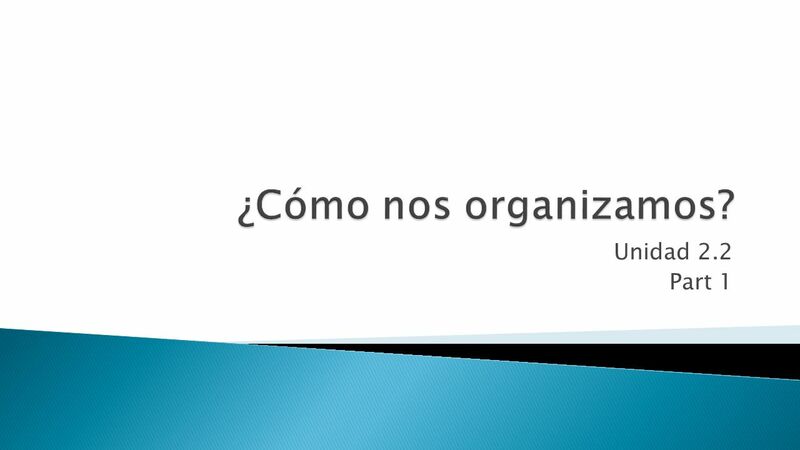 Download ppt "Unidad 2.2 Part 1. 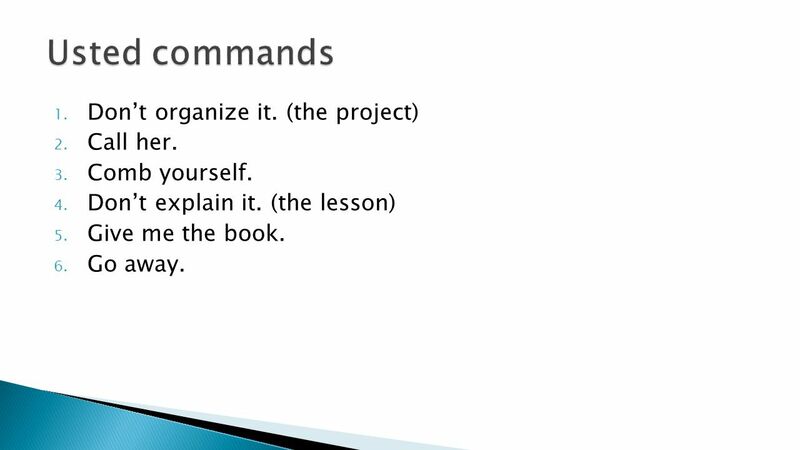  In this lesson you will learn to:  Talk about media and the community  Use pronouns with commands  Make requests and recommendations." 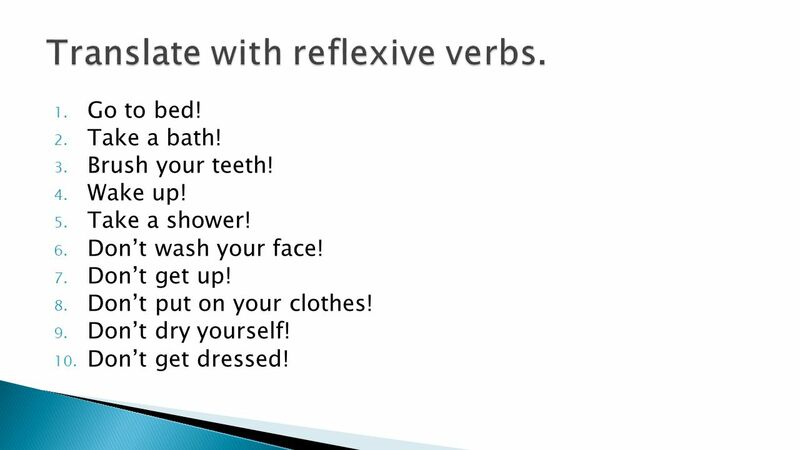 Lesson 4 Grammar Reflexive Verbs What people do to themselves. Capítulo 2A – Los verbos reflexivos Diego Rivera (México) – Baile en Tehuantepec. 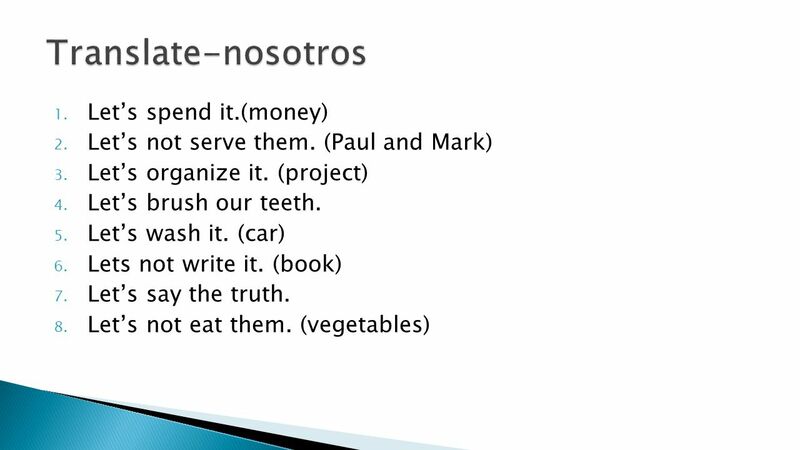 Los verbos reflexivos By Jami Sipe Reflexive Verbs. 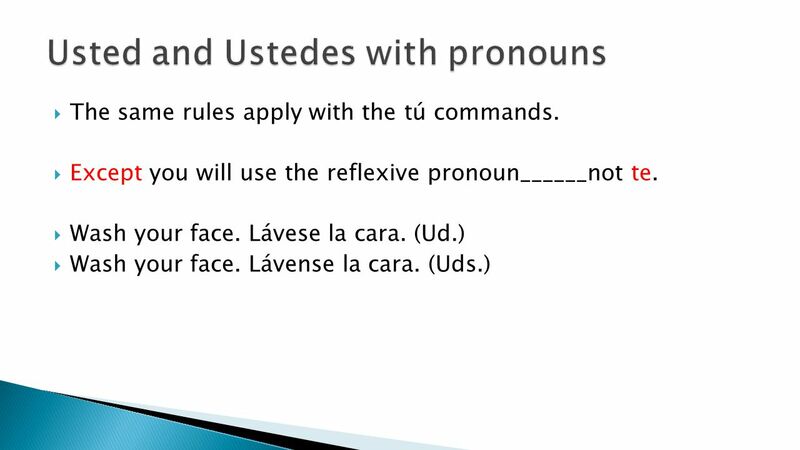 Spanish 2A A reflexive verb is used when the subject and the object are the same. The subject is the person doing the action The object to the person/thing.